Branch & Reduce and dynamic programming on graphs of bounded treewidth are among the most common and powerful techniques used in the design of moderately exponential time exact algorithms for NP hard problems. In this paper we discuss the efficiency of simple algorithms based on combinations of these techniques. The idea behind these algorithms is very natural: If a parameter like the treewidth of a graph is small, algorithms based on dynamic programming perform well. On the other side, if the treewidth is large, then there must be vertices of high degree in the graph, which is good for branching algorithms. We give several examples of possible combinations of branching and programming which provide the fastest known algorithms for a number of NP hard problems. All our algorithms require non-trivial balancing of these two techniques. In the first approach the algorithm either performs fast branching, or if there is an obstacle for fast branching, this obstacle is used for the construction of a path decomposition of small width for the original graph. Using this approach we give the fastest known algorithms for Minimum Maximal Matching and for counting all 3-colorings of a graph. In the second approach the branching occurs until the algorithm reaches a subproblem with a small number of edges (and here the right choice of the size of subproblems is crucial) and then dynamic programming is applied on these subproblems of small width. We exemplify this approach by giving the fastest known algorithm to count all minimum weighted dominating sets of a graph. We also discuss how similar techniques can be used to design faster parameterized algorithms. 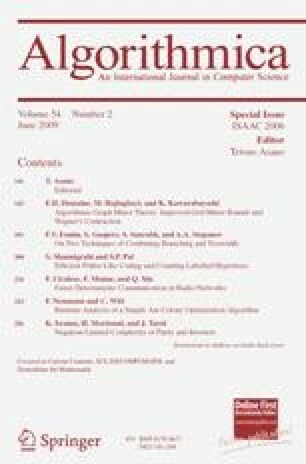 A preliminary version of this paper appeared as Branching and Treewidth Based Exact Algorithms in the Proceedings of the 17th International Symposium on Algorithms and Computation (ISAAC 2006) . Additional support by the Research Council of Norway.